“Because the fundamental immorality of the tour has never registered with the MCC’s old farts, the argument has always proceeded on entirely false premises. Eighteen months ago [at the World Cup] it was security, a non-issue, since the only people not at risk in Zimbabwe were the England team. Today it is press accreditation, a mere sideshow, just a symptom of the arbitrary way tyrants like Mr Mugabe behave. In a wall in Zimbabwe. South Africa captain Graeme Smith is in doubt for the second Test against India after a car ran over his foot. Smith was walking towards the team hotel after practice when the chauffeur of his car unintentionally drove over his right toe, witnesses said. must not laugh at South Africans run over by cars. Anil Kumble is just 4 wickets away from breaking Kapil Dev’s record. (incidentally, just noticed at Cricinfo that his full name is Kapildev Ramlal Nikhanj). A marvellous achievment from Kumble, one of my favourite bowlers and who I modelled my action on when I was bowling. Meanwhile, the 2nd Test is due to start in about 16 hours. As usual India are under pressure(!) to win, especially as they were considered favourites at the start of the series. South Africa’s tactics in the 1st Test were one of defence and obdurity – more interested in saving the Test and not even thinking about winning it. Their lack of confidence with themselves is remarkable – it wasn’t long ago they had Pollock & Donald, an awesome fast-bowling combination, and were the only team who could take Australia to 4/5 days. This new mindset bodes well for England’s trip in a month’s time – how will SA cope with England’s attacking play? It’ll be interesting to see if India can really attack tomorrow from the outset, and dominate the match from ball one. Tony Cozier outlines the negative ramifications of the West Indies sending a second-string team to Australia. OK so England will play their first ODI against Zim on Sunday in Harare. The ZCU complained of the severe financial loss they would concede at the loss of one of the matches (20%). England’s reply? Time has been wasted, and it’s not our fault – my God, is this the ECB actually making a point for once? An excellent hundred, albeit against a New Zealand team in decline. Their “attack” doesn’t stand up to much, especially against one of the best batting lineups in the last 20 years. Langer recorded his 20th Test Century – a very special achievment, joining The Elite; Ponting, Inzy, Richards, Boon, Boycott, Tendulkar, Gavaskar….Lara, of course. To name but a few. I feel pretty good and we’re in a pretty good position. I started cramping – I tend to do that at Adelaide – after lunch and that probably affected my concentration. But that went away and I felt pretty good. I don’t think it’s one of my best. Besides the first couple of overs and a couple with the second new ball, it was a gritty innings. But my balance was really good because footwork is one area of my game that I’ve had to improve over the last 12 to 18 months. Statistics are a really funny thing in cricket. When you are playing the game they mean a lot. I spoke to Tugga [Steve Waugh] a couple of months ago and he said that in retirement statistics mean nothing. While I’m playing and getting paid to score runs it means I hopefully get a game next week. It’s a very good wicket and is actually getting more carry than I’ve seen before. I’m not sure it’s going to get up and down. We’re going to have to give ourselves plenty of time to get 20 New Zealand wickets. It was a big banging double noise so he must have thought that he’d thumped it into the ground. He was probably hoping it was a bump ball because he was starting to hit it pretty well. I thought it was out. I’m not saying it was obvious, but it looked to me that it was it probably out. The umpires did the right thing. If the technology is there they might as well use it. They fought hard all day. Jacob Oram is an outstanding cricketer to bowl that economically on that track. Chris Martin runs in hard all day and hasn’t had that much luck, but definitely has the spirit. They were a bit quiet, but I’m not sure how they play. They had a tough week last week, it was 38 degrees or so, they lost the toss on a good wicket. They did an admirable job. I keep telling Haydos that he’s the blocker and I am the aggressor. I can’t believe he’s playing one-day cricket and I’m not. [The rooms laughs loudly] He knows how I feel about this. , girlfriend of SA Captain G.Smith. I now have a non-cricketing reason to hate him – hurrah! 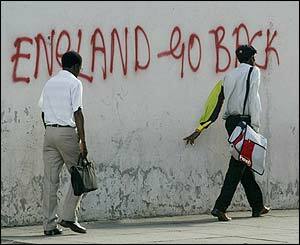 Looks like England’s tour of Zimbabwe is back on. The Zimbabwe government said it had lifted the ban and blamed the delay on insufficient information being provided by the journalists. What information was delayed? One of the most confusing and ridiculous things about this media ban was Mugabe didn’t refuse The Daily Mail. They’ve been one of the most aggressive and leading anti-Mugabe newspapers – perhaps Mr Mugabe confused the amount of content being written about his regime/govenment as being complimentary.